“I Don’t Give a **** If You Believe in Climate Change…” – Redlog Environmental Ltd.
Paris Agreement, climate change, and greenhouse gasses – do you understand what these terms really mean? Do you understand that decisions we make today will have consequences far into the future? While climate change may seemingly have no apparent consequence to the day-today activities of most HSE professionals, I firmly believe that each and every HSE professional should spend time educating him/herself on this important issue. I first became aware of the potential seriousness of the climate change issue as I was completing my doctorate at the University of Alberta (U of A) in Canada. At that time, I believe 1989, Dr. David Schindler moved to U of A and into an office down the hall from my office. Few of you will know of Dr. Schindler, but he is one of the most prominent freshwater scientists in the world, and his research and seminal publications on acid rain and phosphorus impacts on lakes was instrumental in leading to regulations of related pollutants into the environment. Dr. Schindler is truly one of the world's top scientists, and when I learned that he had started investigating this issue it was evident to me that climate change was an issue to be taken seriously. While I am not a climate change expert, I do have a reasonable background in science, data collection and analysis, statistics and predictive modeling (after all these were the cornerstones of my doctoral thesis work). I find that the evidence of man-made climate change is overwhelming, and I am not going to review this here. For those interested on learning more about various views on climate change, I will leave it to you to look into this yourselves. There are many websites that outline various aspects of this “debate”, e.g., SkepticalScience, ProCon.org, etc. Rather than engage in a debate on the merits of the science, I would like to simply present the thoughts of two very different individuals on this important topic. Neither are scientists but both raise important questions that go beyond the merits of the science, computer models and economics that are at the root of many climate change debates. "There are always a few of you, asking why we should care about the temperature rising, or questioning the science of climate change. I want you to know that I hear you. Even those of you who say renewable energy is a conspiracy. Even those who say climate change is a hoax. Even those of you who use four letter words. I've heard all of your questions, and now I have three questions for you. Let's put climate change aside for a minute. In fact, let's assume you're right. First - do you believe it is acceptable that 7 million people die every year from pollution? That's more than murders, suicides, and car accidents - combined. Every day, 19,000 people die from pollution from fossil fuels. Do you accept those deaths? Do you accept that children all over the world have to grow up breathing with inhalers? Now, my second question: do you believe coal and oil will be the fuels of the future? Be sides the fact that fossil fuels destroy our lungs, everyone agrees that eventually they will run out. What's your plan then? I, personally, want a plan. I don't want to be like the last horse and buggy salesman who was holding out as cars took over the roads. I don't want to be the last investor in Blockbuster as Netflix emerged. That's exactly what is going to happen to fossil fuels…. I have a final question, and it will take some imagination. There are two doors. Behind Door Number One is a completely sealed room, with a regular, gasoline-fueled car. Behind Door Number Two is an identical, completely sealed room, with an electric car. Both engines are running full blast. I want you to pick a door to open, and enter the room and shut the door behind you. You have to stay in the room you choose for one hour. You cannot turn off the engine. You do not get a gas mask. I'm guessing you chose the Door Number Two, with the electric car, right? Door number one is a fatal choice - who would ever want to breathe those fumes? This is the choice the world is making right now. … I don't give a damn if you believe in climate change. I couldn’t care less if you're concerned about temperatures rising or melting glaciers. It doesn't matter to me which of us is right about the science. I just hope that you'll join me in opening Door Number Two, to a smarter, cleaner, healthier, more profitable energy future." If you think I am going to argue with Arnold, you're crazy! The second notable person is the statistician, trader, philosopher and most famously author of the Black Swan and several other popular books, Nassim Nicholas Taleb. In his essay entitled, Climate Models and Precautionary Measures, Taleb presents an argument against those that contend climate change models are inaccurate and thus we should not make changes to policy based on these models. In short, Taleb’s argument is that we have only one planet. Thus, even a risk with a very low probability becomes unacceptable when it affects all of us because mistakes of that magnitude cannot be reversed. We should thus “build down CO2 emissions, even regardless of what climate-models tell us”. This is effectively a risk:reward analysis - when the consequence of an action is totally unacceptable and irreversible then we must do what we can to prevent this from happening. Both of these gentlemen are stating the same thing, that the consequences of inaction are too great to spend time debating the merits of the issue and that the time to act is now. 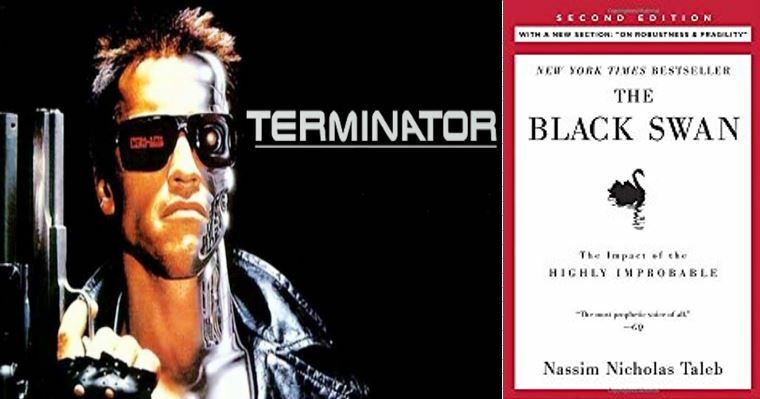 Photo Credits: Arnold and Solar Panels image from Facebook; Black Swan image from Amazon.com; Terminator image from YouTube. Posted in Asia, Environment, General, HSE, Middle East and tagged Climate Change, GHG. One thing is Climate Science, another thing is Climate Politics. Politicians need to understand exactly what Climate is.